Add Mediterranean panache to meals with an olive oil bursting with the summer-drenched combination of basil and sun-dried tomatoes. Perfect with Italian-style breads or pizza crusts, these dipping oils are also delicious when used in your cooking. Nothing evokes the aroma and taste of Mediterranean cuisine like the signature ingredients of basil, olive oil and sun-dried tomatoes. 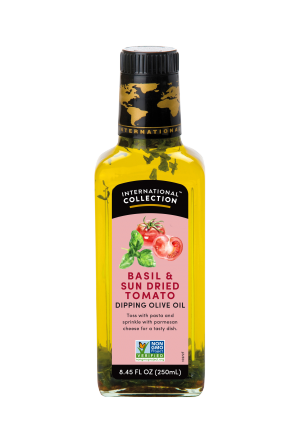 International Collection’s dipping oils have been created to accompany any starter or main dish, and are a wonderful addition to salads of fresh tomatoes, avocado and mozzarella. They can also be used to add flavor to soups, sauces and dressings.